The leaves were changing (and even falling), but that did not deter a group of WCGMC folks from making a fourth trip to St. Lawrence County in late September. 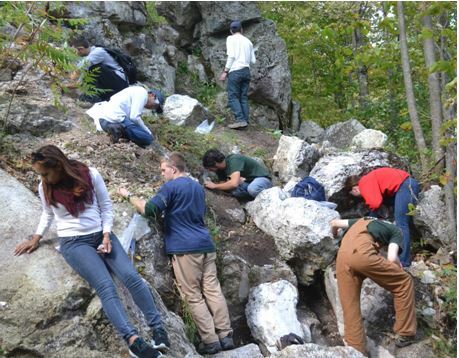 This time we were joined by 16 undergraduate geology majors from SUNY-Plattsburgh and their professor Dr. Mary Roden-Tice. It was truly wonderful to see so many young and eager folks enjoying geology and a day of collecting. The brilliant sun and the absence of mosquitoes did not hurt either. 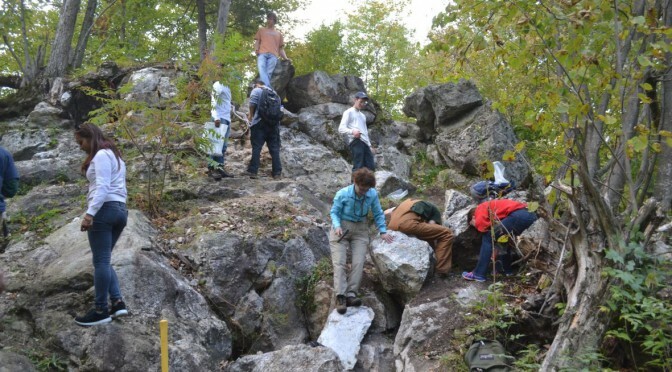 Half of the SUNY-Plattsburg students have gathered near the top of the original Rose Road skarn site. Sky blue apatite has been spotted.